Welcome Rotarians! We appreciate your interest in sponsoring a young person to go to RYLA. RYLA can be a life-changing experience for youth, which can only be made possible through your support! If you would like to become a RYLA facilitator, please click here. How does your club get a student to RYLA? 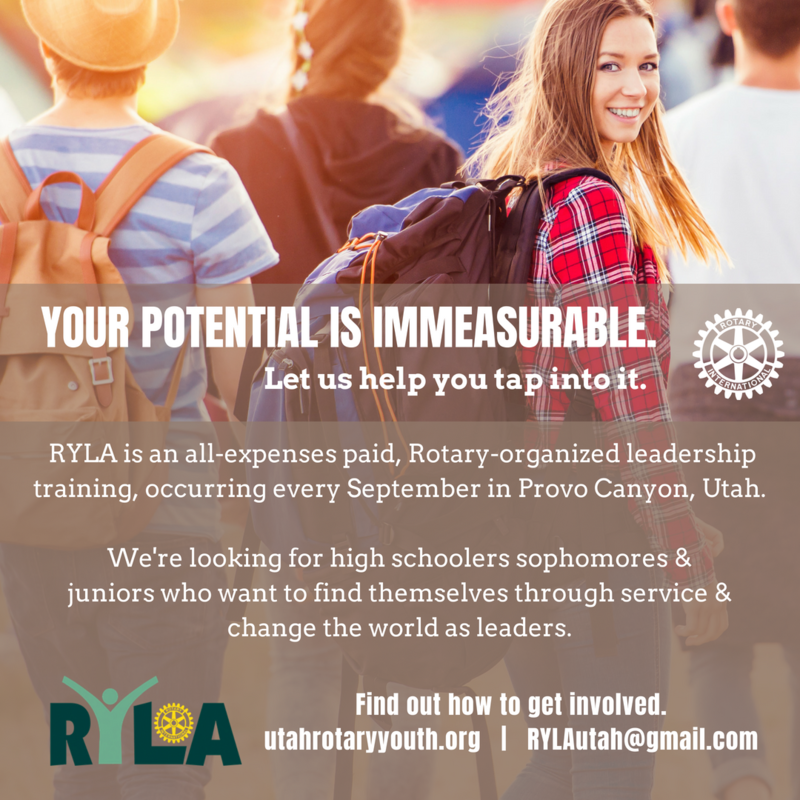 Spread the word about RYLA to high school administrators, Interact clubs, and any high school sophomores & juniors. Click here for a promotional flyer. Select which student/s your club would like to sponsor for RYLA, before September 1. Once you have your student/s name & school info, email info to RYLAUtah@gmail.com and we will respond with the RYLA Award Letter which includes the hidden URL of the registration page, and specific instructions the student will need to correctly register. Additionally, you'll get access to our Google doc to track the progress of your students' registration process. Let your student/s know they've been selected by sending the RYLA Award Letter and this RYLA Certificate (which you complete). Selected students register for RYLA with their parents, by going to the URL listed in their RYLA Award Letter-- which is the ONLY way to get to the registration page. Students will e-mail their documents to RYLAUtah@gmail.com before September 15. Check the progress of where students are in the registration process by accessing the Google doc. Email RYLAUTAH@gmail.com with questions. Your club is responsible to transport your student/s to and from RYLA, as no student is allowed to drive themselves. Please make transportation arrangements before September 1, and e-mail RYLAUtah@gmail.com the name & contact info of the driver. Please make your RYLA payment ($275 per student) by clicking HERE. Please ensure that RYLA students arrive at Aspen Grove (<-- click link for map) between 5:30-7:00pm on Wednesday, September 26. Students can be picked up between 1:30pm on Saturday, September 29. Click HERE for more transportation details. Contact your RYLArians, and schedule a time when they can attend your Rotary meeting to share about their experiences, what they learned, and to thank their sponsors. Encourage students to stay involved in the Rotary family through their Interact club.